The GSTN has introduced the new RFD-01A form for Refund on Account of Excess Payment of Tax. In these article we will see the detailed analysis related to the Refund form, Rules and how to file the refund form online. √ When refund application on account of excess payment of tax can be filed? Ans. Refund application on account of excess payment of tax can be filed, when the taxpayer has paid excess tax (in the form of advance tax or tax deducted/collected at source or self-assessment tax or payment of tax on regular assessment) against the tax required to be paid by him. √ Who all can file refund application using ground as “Excess payment of Tax”? √ What is the minimum amount that can be claimed while filing refund application using ground as “Excess payment of Tax”? Ans. Refund can be claimed for the amount of Rs.1000 or more while filing refund application using ground as “Excess payment of Tax”. √ What are the relied upon documents which I have to upload with refund application on account of excess payment of tax? Ans. Taxpayer have to upload documents as are required to be filed along with Form RFD-01A, as notified under CGST Rules or Circulars issued in the matter and other such documents the refund sanctioning authority may require. In case, the refund amount claimed is more than 2 lacs, then the taxpayer needs to mandatorily upload Certificate from CA/ICWA in Annexure 2 to the refund application. In case, refund claimed amount is less than 2 lacs, then the certificate is not required, taxpayer needs to provide self-declaration only. √ Can I file for multiple tax period in one refund application? Ans. No, you cannot file for refund of multiple tax period in one refund application. One refund application can be filed by the taxpayer for a month for claiming refund of excess amount paid. √ Do I need to upload any statement of invoices for claiming refund? Ans. No statement template is available for uploading the invoice details for claiming refund. You need to mention the refund to be claimed details in the statement 7 available on the refund application screen while filing refund application. 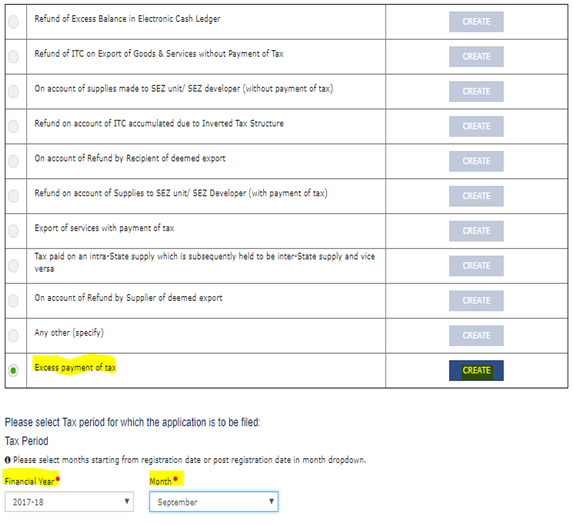 √ Whether there is any ledger entry on filing refund application? Ans. As the taxpayer is claiming refund of the tax amount paid, there is no ledger entry in Electronic Credit Ledger/ Electronic Cash Ledger. Now we will see the online procedure to file the application through the portal. 1. Login > Services > Refund > Application for refund type, then click on create tab and select the refund period month. The refund amount claimed cannot be more than the amount of tax paid from the respective return against which refund is filed. Refund can be claimed for the amount of Rs.1000 or more. 4. Select the Bank Account Number from the drop-down list. 5. Under section Upload Supporting Documents, you can upload supporting documents (if any). √ Maximum 4 supporting documents can be attached. √ Maximum file size for upload is 5MB. √ If supporting documents is more than 4, then the remaining documents can be handed over in hard copy during personal hearing. 7. Click the PREVIEW button to download the form in PDF format. 10. After successful filing of refund form the success message is displayed and status is changed to Submitted. Application Reference Number (ARN) receipt is downloaded and ARN is sent on your e-mail address and mobile phone number. Click the PDF to open the receipt. ♦ The system generates an ARN and displays it in a confirmation message, indicating that the refund application has been successfully filed. ♦ GST Portal sends the ARN to registered e-mail ID and mobile number of the registered taxpayer. ♦ Filed applications (ARNs) can be downloaded as PDF documents using the My Applications option under Services. ♦ Filed applications can be tracked using the Track Application Status option under Refunds. ♦ Once the ARN is generated on filing of form RFD-01A, refund application shall be assigned to Jurisdictional Refund Processing Officers for processing. The application will be processed and refund status shall be updated. ♦ The disbursement is made once the concerned Tax Official processes the refund application.